Scott Stanton is an avid traveler, writer, and, as he puts it, "a really mediocre guitarist." His latest book, The Tombstone TouristMusicians, chronicles the final resting places, shrines, homes, and memorabilia of over 500 dearly departed musical artists throughout the world. Raised in the musically rich environs of Southern California during the sixties, Stanton spent nearly a decade working in recording studios and the "soulless bar circuit" before, in his words, "It became apparent to all that my talents lie somewhere outside the music industry." After ten years spent on the road in search of all things musical, his articles and photographs have been featured in dozens of diverse outlets such as Guitar World, Revolver, ABC News Online, and VH1's Behind the Music. Today he lives in the Pacific Northwest with his wife and daughter. For the true fan of music, specifically blues, jazz, gospel, and zydeco, there are no two cities that encompass a more exciting and varied music scene than Memphis, Tennessee, and New Orleans, Louisiana. Linking these two historic cities via highway 61 through the fertile (both musically and agriculturally) Mississippi Delta offers the adventurous road trip vacationer the perfect antidote to those "all inclusive" resort packages. We begin our adventure in Memphis, Tennessee, home of big band legend Jimmie Lunceford, blues legend Furry Lewis, piano great Memphis Slim, and some guy named Elvis. After checking into the historic Peabody Hotel (even if you're not staying here, be sure to stop by the downtown landmark for a drink in the lobby featuring original stained-glass skylights and the travertine-marble fountain that is home to the hotel's resident ducks) stop by Lanksy's boutique inside the hotel. Owned and operated by Bernard Lansky, he is known as the "Clothier to the King," Elvis Presley, and maintains a large collection of outfits and memorabilia he collected as Presley's personal tailor. While most travel writers would have you believe that Memphis is only Graceland (a must for fans and non-fans alike), the sites and sounds of Soulsville, USA - The Stax Museum of American Soul Music (featuring Issac Hayes' 1972 gold-trimmed "Superfly" Cadillac Eldorado), the Rock and Soul Museum (reopening September 1st), Sun Studios (the original recording studio of Jerry Lee Lewis, Elvis, Johnny Cash, Howlin' Wolf, B.B. King, Roy Orbison, and Carl Perkins), the Smithsonian Rock 'n' Roll Museum (located next to the Gibson guitar factory), and Beale Street would prove them wrong. For once and for all, for all the blues tourists out there who want to see the crossroads where Johnson sold his soul to the devilTHERE IS NO ONE CROSSROADS! The single most asked question at every information center and blues museum in Mississippi will always yield the same answer. Yet despite the fact that there are hundreds of crossroads within the Delta region, tourists continue to look for the elusive site. 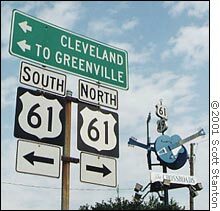 So in answer to this obvious pent-up demand, the Mississippi Visitors Bureau has marked the "official" crossroads location at the intersection of Highway 61 and 49. Fortunately for Robert Johnson fans, the Greenwood Blues Heritage Museum in Greenwood, Mississippi, boasts the largest collection of Robert Johnson related memorabilia, including the only two known photographs of the blues master. Outside of Memphis, Jackson, and New Orleans, one would be hard pressed to find live music during the week. So it is best to plan traveling through the Delta region during the weekend, as most of the performers have day jobs during the week. After two full days on the town (and a slab of world famous Rendezvous Ribs), head south on that famous blues highway -- Highway 61. Although today the route is pockmarked with billboards and casinos, Highway 61 was the passage by which Muddy Waters, Elmore James, B.B. King, Bessie Smith escaped the south in search of a better life. Oddly enough just one hour outside of Memphis, located within the Horseshoe Casino-Hotel, is the 5,000-square foot Blues and Legends Hall of Fame filled with artifacts, memorabilia, and photographs of blues legends of Memphis, Mississippi, and Chicago. One of the highlights on display is the last guitar Stevie Ray Vaughan played just moments before his tragic death in 1990. Next stop on the blues highway is Clarksdale, Mississippi -- birthplace of Muddy Waters, childhood home of Sam Cooke, and where Bessie Smith drew her last breath. Located at the intersection of Highway 61 and 49 (also know as "the Crossroads," where legend has it that Robert Johnson sold his soul to the devil) Clarksdale has long been considered the home of delta blues. Despite it's modest size, Clarksdale has a wealth of activities including the New Delta Blues Museum (great new location in the old train station, but that life-size replica of Muddy Waters still freaks me out! ), the Crossroads Monument, Ground Zero Blues Club (co-owned by actor Morgan Freeman featuring live music four nights a week), Ike Turner's home, Sam Cooke's home, the Riverside Hotel (former African-American hospital where Bessie Smith died in 1937 after a automobile accident), the Sunflower River Blues and Gospel Festival (August 13-14), and future site of the WROX blues museum. Before you venture out, make your first stop at Cat Head, a one-of-a-kind delta blues and folk art shop. Located on Delta Street, Cat Head is "like shopping in a juke joint" explains owner Roger Stolle. Aside from a great select of CDs, books, DVDs, and southern folk art, Roger is more than happy to point visitors towards live music, local attractions, as well as directions to all three of Robert Johnson's gravesites. Of course no visit to the Delta would be complete without spending the night on Hopson's Plantation at the Shack-up Inn. The inn has become quite an attraction with visitors from around the world seeking to spend a night or two in the authentic sharecropper shacks surrounded by the original cotton gin, seed houses, and other plantation outbuildings. The corrugated tin roofs and cypress walls were restored only enough to allow for modern conveniences (i.e. indoor plumbing). From Clarksdale there are several options for the adventurous traveler. Civil War enthusiasts and history buffs will want to continue down Highway 61 through Vicksburg hometown of Willie Dixon and the new Vicksburg Blues Museum), Port Arthur, and Natchez (the oldest settlement on the mighty Mississippi River). Blues aficionados and those with a knack for getting hopelessly lost will want to venture south on Highway 49 through Indianola (birthplace of B.B. King and Albert King), Tutwiler (final resting place of harmonica legend Sonny Boy Williams II), Yazoo City (spend a couple of bucks for the Yazoo City Blues Tour), on down to Jackson (the state capital) featuring live music at 930 Blues Café, The Crystal Lounge, Red Hot and Blue, and the Sunshine Pizza Factory. From Jackson one could take the highway straight into New Orleans, however I have always found the best food, the oddest tourist attractions, and greatest stories are easily discovered on the two-lane roads and small towns that make up the majority of Mississippi. But however you make your way into the Crescent City, drop off the car, grab your copy of Access New Orleans, and Bon Temps Roule!